Situated on spectacular Cape Breton Island sits Thyme for Ewe Farm, owned and operated by Tim and Estelle Levangie along with their three young sons, Elliot, Victor and Theo. Born and raised in East Bay, Cape Breton, Tim met Estelle while studying at Nova Scotia Agricultural College (now Dalhousie Agricultural Campus) in 2007, Estelle on the other hand was raised on a dairy farm in the Northern part of France. After leaving the Agricultural College the couple dated long distance for awhile until Tim moved to France for a year to be with Estelle – and in 2009 she immigrated to Nova Scotia. 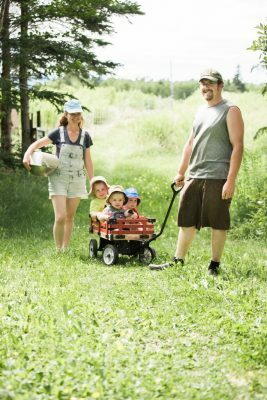 In 2010 they purchased a run-down nursery business and began their dream of owning their own farm. “It took a lot of elbow grease to clean up the place, and it’s still a work in progress,” Tim added. Thyme for Ewe Farm grows a market garden and uses hoop houses for vegetables, herbs and ginger. Here they also raise free range chickens, pastured pigs and cows. This will be their first year participating in Open Farm Day! Visitors will be given a tour of the farm and get to check out the garden as well as have the chance to pet some goats and pigs, and see where the animals live. Did you know: most people are unaware that you can grow ginger in Canada – and most don’t know what it looks like! Thyme for Ewe Farm can’t wait to meet ewe on the farm!